The Columbia River, flowing through the Pacific Northwest, is the fourth largest river in North America. The Colorado River, the major river in the desert Southwest, is a tiny stream compared to the Columbia, but it is probably the most litigated river in the world. Both these rivers once flowed with a force that overwhelmed the people who tried to navigate their rapids or control their currents and flood flows. That was until the Hoover, Bonneville and Grand Coulee Dams were built in the 1930s, finally taming these wild rivers and conscripting them into industrial service. 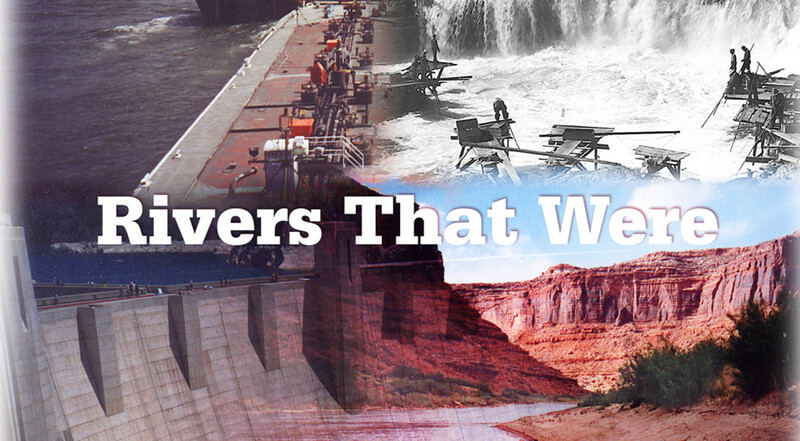 Rivers That Were is a two-part documentary by Barbara Bernstein. These two hours explore the long-term consequences of over a century of redesigning nature to suit commercial and industrial needs. The programs juxtapose the voices and viewpoints of Native Americans, barge operators, water engineers, environmentalists, policy makers and others who live and work in the watersheds of these two mythic Western rivers. Part One: Working Water compares two environmental crises. On the Colorado River Basin, it’s the ongoing effort to restore the Salton Sea. On the Columbia, it’s the confounding crisis of how to clean up one of the most toxic sites in the world, the Hanford Nuclear Reservation. Part Two: Beaver Taught Salmon How To Jump recreates the once natural and free-flowing tributaries and mainstem of the Columbia River, the Great River of the West. The river that was is contrasted with today’s industrialized landscape of culverted urban creeks, hardened riverbanks and inundated waterfalls and rapids.